While a growing number of today’s so-called home entertainment projectors are actually presentation PJs masquerading as movie machines, the BenQ W2000 is the real home cinema McCoy – despite its attractive £800 ticket. Its living room rather than board room credentials are clear as soon as you look at it. Yes, it’s slightly larger than many projectors in its price bracket, but it's more attractively shaped than most business models and even features a bit of bling in the form of a gold front panel that sits nicely – if a tad ostentatiously – against the glossy white of the unit's other edges. Connections comprise two HDMIs, a D-Sub PC port, an RS-232C port for system integration, a 12V trigger jack, mini and standard USB sockets, and even a 3.5mm audio loopthrough in recognition of the W2000’s built-in speaker system. The USBs don’t support data playback. Yet while one is only for service use, the other can attach an optional Wireless Full HD Kit so you can transmit HD pictures and sound from your sources to the W2000 cable-free. It’s worth adding that one of the HDMIs supports the MHL protocol for projecting content stored on your mobile phone. Picture specifications are promising. The 2,000 lumens of brightness is fairly typical for sub-£1,000 projectors these days, but it’s not nearly so common to find this allied to a claimed contrast ratio as high as the W2000’s 15,000:1. Where things really get interesting, though, is with BenQ’s new 'Cinematic Color' feature. This uses a specially angled colour wheel, with a newly designed coating, to deliver what BenQ claims is accurate support for the industry’s REC.709 video standard right out of the box. And BenQ’s engineers check the REC.709 calibration at three different stages in the production of every unit; this isn’t just some computer-generated ‘more or less’ calibration claim. The fact that the colour wheel is a six-segment (RGBRGB), six-speed design bodes well, as it should limit the potential for single-chip DLP’s ‘rainbow effect’ to spoil the fun. Despite this pre-calibration ethos, the W2000 features a good suite of colour and white balance management tools, and is endorsed by the Imaging Science Foundation (ISF). Getting the PJ installed within your room is aided by a decent 1.3x zoom, vertical lens shift (plus horizontal and vertical digital keystone correction) and a 12V trigger. And the menu system has been designed not to complicate home cinema novices, too. I kicked off my tests with the Cinema (REC.709) preset BenQ hopes will woo home cinema fans. And right off the bat it really does deliver a natural, well-balanced image. I still tweaked it a touch, with marginal brightness and contrast increases and nudging down its gamma to its 2.1 level to bring out a bit more shadow detail. But this counts as a minimal amount of work before pictures look good. And for the most part that is an adequate description of the W2000's imagery. Detail levels are particularly excellent, pulling out every last pixel of information and every last colour tone nuance from the largescale Egyptian crowd scenes in the gorgeous Blu-ray of Ridley Scott's Exodus: Gods And Kings. DLP’s micro-mirror approach means this sharpness is delivered, moreover, without the image suffering so much as a hint of visible pixel structure, even over tricky areas like the expanses of blue skies and golden sand that often fill large chunks of Exodus...'s frames. The impression of copious detail also owes a large debt to the superb balance the W2000 achieves between colour tones. There are no major problems with colour banding or blocking, and it’s a relief to find that despite the W2000’s pictures being winningly bright they don’t suffer much at all with DLP’s colour striping issue – even when torches flicker against the night sky. The projector falls a little short with its black level response, though. Dark sequences appear both greyer and less rich in shadow intricacies than I was hoping for, based on relatively high-spec BenQ projectors of the past. So in Exodus, I found myself being distracted during Moses’ night-time chats with the big man upstairs when I should have been utterly immersed. 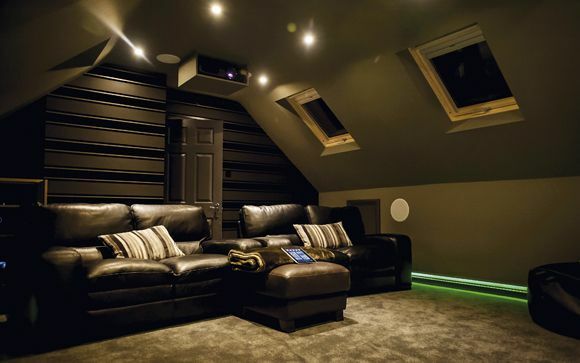 This less-than-stellar black level could be enough of an issue to put off home cinema fans who have taken care to black-out their movie room. Although the W2000’s ability to still be watchable in a slightly more ‘relaxed’ light environment courtesy of its innate brightness may win it a different type of fanbase. Large-scale action scenes, such as the battle near the beginning of Scott's historical romp and the crossing of the Red Sea, enjoy natural-looking motion (important as there's no frame interpolation feature to call upon).More good news concerns the W2000’s input lag – which comes in below 40ms and so shouldn’t heavily impact your video gaming performance – and impressively little noise from its built-in cooling fans. Even the speaker system (2 x 10W) is better than the puny efforts usually found inside projectors; the sound is expansive, open and rounded, and capable of projecting far enough away from the chassis to sound as if it’s coming from at least somewhere in the vicinity of the images it’s supposed to be accompanying. Overall the W2000 is another class home cinema projection act from BenQ. It’s not quite a perfect one because of its black level foibles, but there's enough talent here to satisfy your bigscreen urges.